When one sees Round Towers, it’s only natural to think of Ireland. These impressive monuments from the past have a long, storied and mysterious history; long – because they date back to medieval times; storied – because there are many tales surrounding their purpose; and mysterious – because no one knows the names of those bygone architects who built them. They are mostly found in Ireland, where they were built, sometime between the 7th and 10th century according to the 1911 Encyclopedia Britannica. Their use has provided many theories. Some say they were built as a defense against Viking raiders and that a lookout posted atop the tower could warn of Vikings approaching. The local population could then climb a ladder to the door, which is always high up the side of the tower, and pull the ladder in after them. However, in many instances the towers were built on sites that weren’t ideal for surveying the countryside and it is doubtful that many of the locals could fit into one. Some say they were used to safeguard religious manuscripts and relics and, while the eminent antiquarian, Dr. George Petrie, confirms that they are of Christian ecclesiastical origin and claims they were erected between the 5th and 13th centuries as bell towers to call the locals to service since the Irish word for tower is cloigtheach, which literally means bell house or belfry. Further, they are associated with monastic settlements with the tower door facing the west door of the church. In this way it has been possible to determine without excavation the exact location of lost churches. The height of surviving towers ranges from 59 feet to 130 feet and most are still in existence today due to their round shape which has sustained them against the wear of strong winds. There are about 65 round towers remaining in Ireland, two in Scotland and one on the Isle of Man – most of which are associated with early monastic settlements. However, there are also some modern round towers outside of the monastic sphere of influence. For example, Daniel O’Connell’s tomb at Glasnevin Cemetery had a round tower built above it after his burial in 1847. 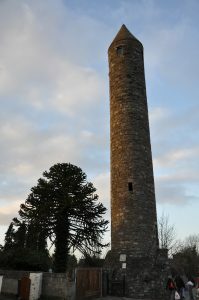 At the Irish National Heritage Park at Ferrycarrig in County Wexford stands a 19th-century copy of a round tower erected to the memory of the Wexford men, who fell in the Crimea War. At St. Ita’s Hospital in Dublin there is a replica round tower built in 1844 as a memorial to politician George Hampden Evans by his wife. In the Knockmealdown Mountains in County Waterford stand a 59-foot round tower erected in 1935 on the spot where Liam Lynch, military leader of the anti-treaty Irish Republican Army fell in 1923 during the Irish Civil War. The Ulster History Park in Co. Tyrone also has a replica of a round tower. The Chaine Memorial Tower in Larne Co. Antrim is a lighthouse done in the style of a round tower and was built to commemorate James Chaine, a former MP for Antrim. There are also towers outside the Celtic world of Ireland, Scotland and Man. One round tower was built in 1997 in the Island of Ireland Peace Park in Belgium, as a war memorial to the soldiers of Ireland who died, were wounded or went missing during World War I. 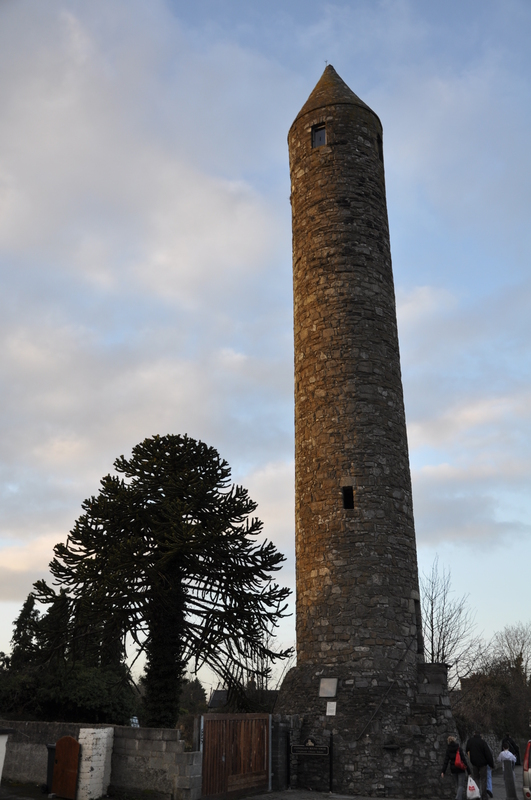 That 110-foot tower was partially built with stone from a former army barracks in Tipperary. Another 42.6 foot tower stands by St John the Evangelist Catholic Church in East Melbourne, Victoria, Australia, completed in December 1900. America is not to be excluded from the lists either for at Saint Mary’s Cemetery on Cedar Street in Milford, Massachusetts a 73-foot round tower was built of Milford granite in 1894 as a memorial to central Massachusetts’ Irish immigrants, of whom thousands are buried there. Father Patrick Cuddihy, credited with its construction, once said, ‘It may be folly, yet when you and I have passed away, the Irish in America will make a pilgrimage to the Irish round tower in Milford.’ It was a dream that embodied his childhood memories, his Irish nationalism and his religion. Father Cuddihy, born in Cashel, Co. Tipperary, grew up in the shadow of the Rock of Cashel on which stands one of Ireland’s most famous round towers soaring 92 feet above Tipperary’s golden vale. Cuddihy’s structure differs from traditional Irish towers in that its door opens at ground level – permitting access without the use of a ladder. When completed the coned roof was crowned by a cross and, as was his wish, Father Cuddihy sleeps not far from his cherished tower in a crypt beneath St. Mary’s. Thanks to Connecticut Historian, Phil Gallagher, for tipping me to that one. In 2002, another of Tipperary’s sons, Dr. Tony Ryan, built a round tower at his Castleton Lyons Stud Farm in Kentucky to serve as a beautiful reminder of Ireland. Constructed with fieldstone taken directly from the grounds that surround it, the Tower is an exact replica of the round tower at the Rock of Cashel. The 124.5 foot structure is centrally located in the middle of Castleton Lyons. One hundred forty-four winding steps lead to the top with windows along the way that face the north, south, east, and west. The tower can be seen by travelers flying into the Bluegrass Airport from the North, especially at night when the tower is completely lit. In two years as Hibernians fly in to the next National convention; keep an eye out for it. Each year the farm celebrates St. Patrick’s Day by lighting the Tower in a festive bright green! Since its completion in 2003, the Tower at Castleton Lyons has become a familiar and beloved landmark to many residents and visitors to Kentucky. So, if you think of Ireland whenever you see a Round Tower, wherever you may see it, that’s the way it was meant to be.